This morning, Police Department press officer Inspector Fitzroy Yearwood told Amandala that the Department has not received a formal report from authorities concerning last week’s sabotage of the rappelling platform at the Jaguar Paw property located to the rear of the Nohoch Che’en Archaeological Reserve which occurred on Sunday, September 23. We were unable to reach authorities at the Ministry of Tourism and Culture and National Institute of Culture and History (NICH) to find out with whom they spoke, if anyone, concerning what they have deemed a “criminal” act. Meanwhile, country manager for Chukka Caribbean Tours, Valerie Woods, has told Amandala that while authorities continue their investigations, the platform will be undergoing repairs in this coming week and after that its Ultimate Adventure tour, which consists of three stages – zip lining, rappelling and cave tubing in that order – will be back up for use, while other tours are presently continuing. Someone cut the client safety lines and the rope barrier, in addition to making partial cuts to the metal supports of the platform and to the anchor cable. There was also evidence of fire damage to the portions of the entrance stairway to the Crystal Cave, according to an official report by the Ministry of Tourism and Culture and NICH released last week. Woods also took the opportunity after our tour to refute multiple allegations made by the Federation of Cruise Tourism Associations of Belize (FECTAB), which has come out sharply against the continued existence of the platform but has categorically denied any involvement in the sabotage. We toured the area for ourselves on Saturday and found that the “hidden” walkway is in fact an earthen and concrete path going up for about 20 minutes – a demanding hike for those not physically fit – to the platform site from the Jaguar Paw property and following the wall of the rock face. Rappelling participants, under the watchful eyes of safety officers at the platform and down below, are secured and guided down to a spot about 60 feet away from the entrance to Cave 3, where they can either walk to where the tubes are located for cave tubing, or cross a small pool to get there, but never getting in the way of or cutting out of turn those already participating in cave tubing. Participants are given water while on the journey, and are not allowed to carry anything, even cameras (they can give them to employees who take the photos they request), and the platform has wooden rails tied together with rope for safety. Woods told us that rappelling was previously done in the same area by the owners of Jaguar Paw when it was operating as a hotel and their guests came down directly on the cliff face; Chukka’s way, said Woods, is safer while providing the same thrill level. 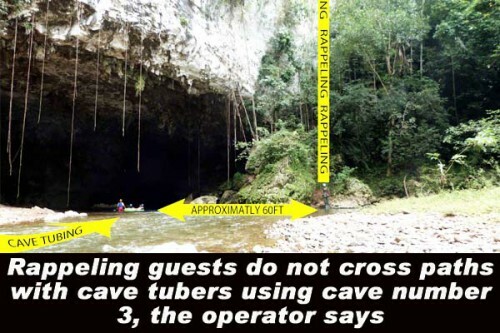 Woods points out that their FECTAB-aligned competitors have cornered much of the market share on cave-tubing-only tours, and are higher rated on websites such as TripAdvisor, and she says that she wishes them well as they have no issues with them. But, she said, she will not allow them to continue “lying” and making “inaccurate statements” about her, her employees, or the tour guides they work with, or to continue suggesting that Chukka’s presence in Belize is “selling out” to foreign interests. For instance, FECTAB has claimed previously that Chukka was hiring Jamaican guides; more recently, reports have surfaced of guides with more experience being fired so that Chukka can pay less to less-experienced guides and drive down costs. Woods waved away all such allegations. The evidence over several years, says Woods, including repeated attacks this year on Facebook and previously in local print media including a recent ad in this newspaper, points to a “personal agenda” on Greenwood’s part dating back to his own personal history with the Jaguar Paw property. “Whenever it comes to that location and any investor doing business at that location, Mr. Greenwood will have an issue,” Woods told us, adding that Chukka has never questioned FECTAB operators’ business practices or leveled the kind of “personal attacks” that they, Chukka, have received from the organization. Far from having an unfair advantage in services or treatment by the Government, said Woods, Chukka must pay three separate leases and comply with all regulations like any other operator, in addition to going through the same security checks as FECTAB-aligned operators, contrary to their claims. “Chukka Belize has been investing in Belize for the past 8 to 9 years. We employ hundreds of Belizeans and do business with several other Belizeans including bus service providers, vendors, restaurants and hotels,” Woods told us, adding that as the previous owners of the property did, they lease the Jaguar Paw property and access to that property, which runs partially next to the archaeological reserve at Nohoch Che’en and next to an adjoining property located behind that, for substantial sums (which she did not disclose) per month. As for access to the property for tours, that is open for a fee to interested Belizeans – including FECTAB operators if they are so inclined, Woods said. The Jamaican company also has business in the Turks and Caicos Islands and is majority owner in Bakabush Adventure Tours. Beginning about 2 to 3 years ago, the company began a rebranding exercise in which the Chukka name is marked on all its property and services, but it is no “just-come” enterprise. Chukka does have a permit from NICH to run rappelling services at its Jaguar Paw property and elsewhere in Belize, but they are not exclusive.